We arrived in Buenos Aires on Christmas Day, the mixture of the long hours of travel and the sticky heat of summer hanging heavy in the air. The cab whisked through the outskirts of the city, the lush landscape and palm trees sailing by the half-open window, the buildings growing more frequent and lines of traffic coiling closer. Pulling up at the turn, we trudged up the narrow, winding staircase, lugging gear behind us and slung over shoulders, killing time and exploring before we began our journey still further south. After a few hours of rest in a nondescript room, with a warm breeze floating through the curtains, limbs splayed out over each other in the twin-sized bed, we headed out to the streets to stretch out legs and take in some of the city in our short time in BA. As soon as we hit the streets, the sun beating down hard on the pavement, people rushing around, cars racing past, it became pretty clear how poorly adjusted we were to city life. After food was found, coffee shops tested out, outdoor markets with soulful music found, drinks and long talks about life, outside a dark bar overlooking the street were had, we retreated to our little apartment, and drifted off to dreams of looming mountain-scapes in tiny towns at the ends of the earth. Rested and the static of excited buzzing around us, we shouldered our gear, and made our way towards the local airport. After a brief flight glitch with Argentinian airlines overbooking our flight, we reconnected in El Calafate, the gateway to Chalten, where the glacial lakes glimmer the most brilliant colors of blue you ever did see, and the wind whips across the desolate pampas, the cool breezes making you feel a little more alive as soon as they touch your bare skin. As the bus made its way towards Chalten, overflowing with bags, slamming us all towards the ceiling and back in our seats with every bump, the sideways wind pushing at the car, the Fitz skyline slowly making its way onto the horizon, the last light of the luxurious Austral summer days kissing the west face of the peaks in a final blaze of light. The next day, the early morning sun pierced through the dusty windows, and the generous amount of daylight promised time spent exploring the terrain stretched out around us. In the not so far off distance though, black clouds were beginning to form, weather threatened, and the air hung heavy with threats behind us. 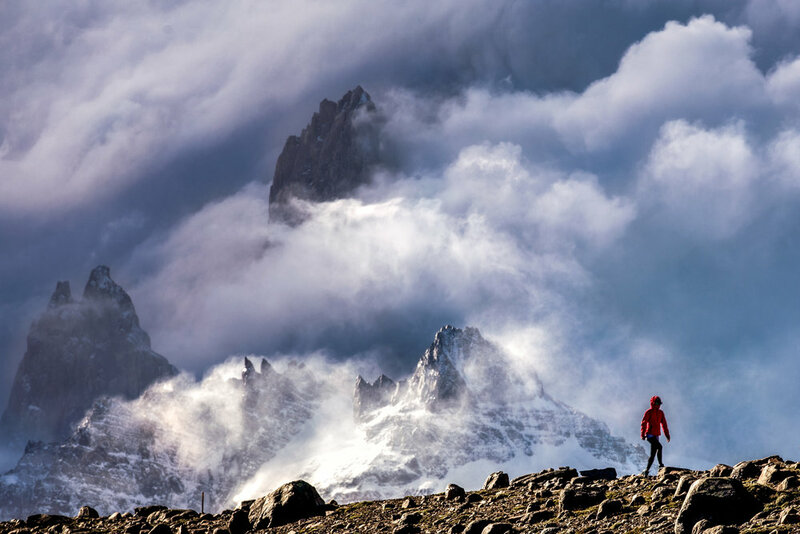 This is how it goes in this part of the world though, and the extreme weather is just part of what makes Patagonia so enticing. The beauty of the unknown, waiting for that perfect window, only to make the good days seem all that sweeter - it not only is part of the experience, but in some ways defines this rugged region. We made a plan: Explore Los Glaciares running long days on the trails, stopping at impossibly blue glacier lakes to take in the needles of granite jutting straight up to the sky, scout out the climbs that we had been dreaming about back in the warmth of our little apartments, boulder in the woods on days the winds were too intense to even walk, and practice, practice, practice at the local crag for when the questionable weather window towards the end of our trip offered some hope for all those big dreams. The nylon walls of the tent rattled with the infamous Patagonia wind, and the soft pattering of rain on fabric was the only sound to break up the violent gusts battering our little home. Craig and I huddled closer together in those walls, our adult fort keeping us cozy and dry against the elements just a few inches away. The weather was suppose to break sometime that night, and we were going for our first objective, Cerro Solo, early in the am. It was 8pm, still light out, but the sky was a constant dim gray, filtering only small amounts of light. Packs ready to go tucked away in the vestibules, we drifted off with dreams of our first big day roaming the higher mountains that surrounded us. When the quick beep of the alarm went off at 2am, the only sound was the local dogs barking somewhere in the distance. The skies were ink-black, and full of only stars. After firing up some boiling water, downing a quick coffee, and some random cookies from our food box, we shouldered our packs and made our way through the sleeping town for the trail. We jogged the 9ks to the trail, the excitement of the climb pushing us forward in those early hours. 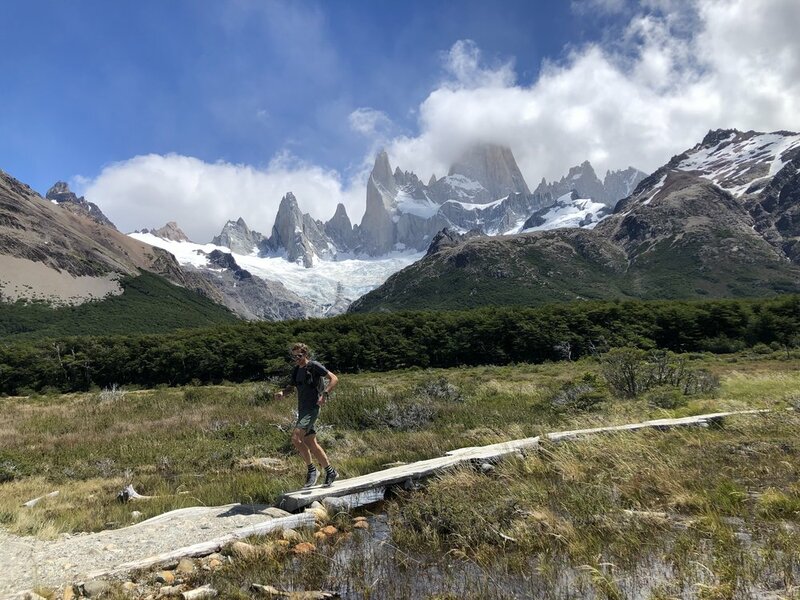 We hit the tyrol to cross the river and start the climb right as the sun was filling the valley with light, and Cerro Torre began to show herself in a blaze of pinks and purples, the summit clearing every few seconds. Even though the temps dropped right at sunrise, and the sweat from our run made us shiver in the early morning, that first light makes my heart so full every single time. The day itself was glorious. 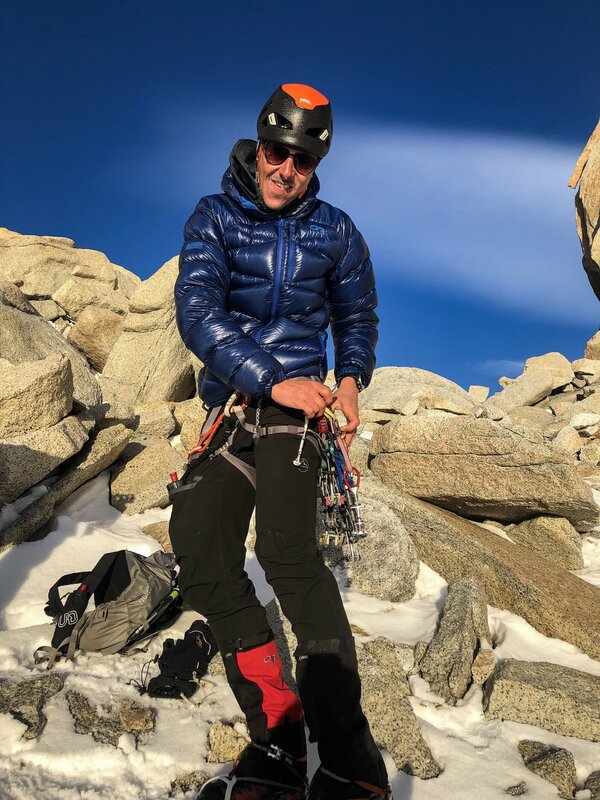 With beta from a local and friend, we navigated to the summit, making only one mistake that required a bit of spicy rock climbing over ice and snow for a better vantage point, but after gaining a clear view, the summit of Solo was an easy snow climb away. 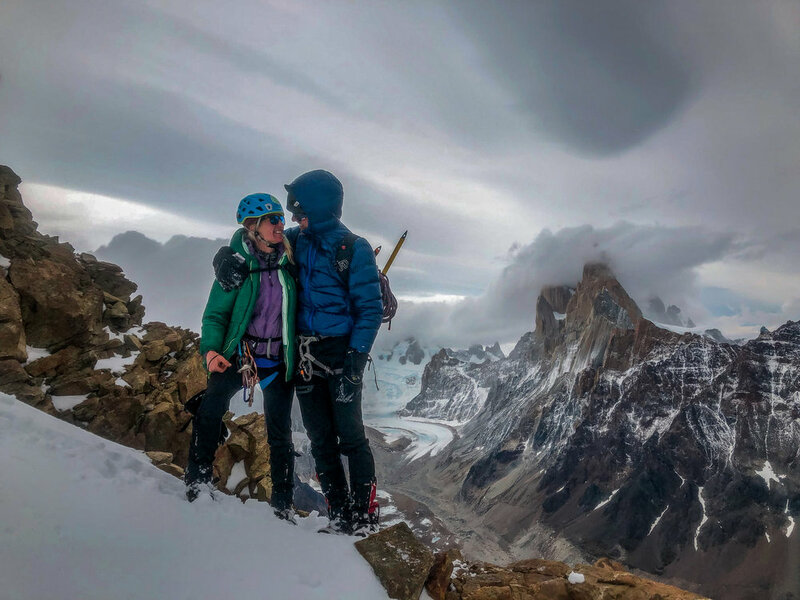 A few moments later, there was nowhere higher to go, and we were looking down on Cerro Torre and the surrounding valleys, stretching out with impossible layers of mountains and glaciers cascading in every direction. The descent involved a 50 degree down climb on snow/ice with gaping crevasses awaiting your mistakes (pretty much my biggest fear), and an endless descent down chossy gullies with loose rock, mud, and scree filling the inside of your shoes and socks, but we had accomplished our first objective, and our tired bodies and mind felt oh-so-good in the glow of bigger adventures in the area. The next day, we woke up tired but satisfied. We were midway into our seemingly endless French press coffee routine, when our friend Juan “Pipa” Raselli came to tell us that the weather window was closing in, to be honest it didn’t seem great - our odds of summiting our big objective for the trip, Aguja Guillaumet were pretty slim, but if we wanted to go for it, we had an hour to pack our stuff and head for basecamp. I’ll be honest with you: we did not jump up from that table and leap into action. We were tired from the 16ish-hour day before, and the thought of rallying, packing, and hiking with big packs for slim chances of success was less than appealing. We were back in town where the Malbec and coffee were plentiful, and we could spend the afternoon sitting in the sun, taking naps and recovering. But at the end of the day, we had traveled to the ends of the earth after all, and neither one of us had ever regretted going for something, even if we failed, and we only had two days left in the area. So we bought the biggest hunks of hard cheese we could find, some chocolate bars and cookies, and threw in two coveted backcountry meals that had been saved for this purpose, packed up what had been our little home for 9 days, and headed off for basecamp. 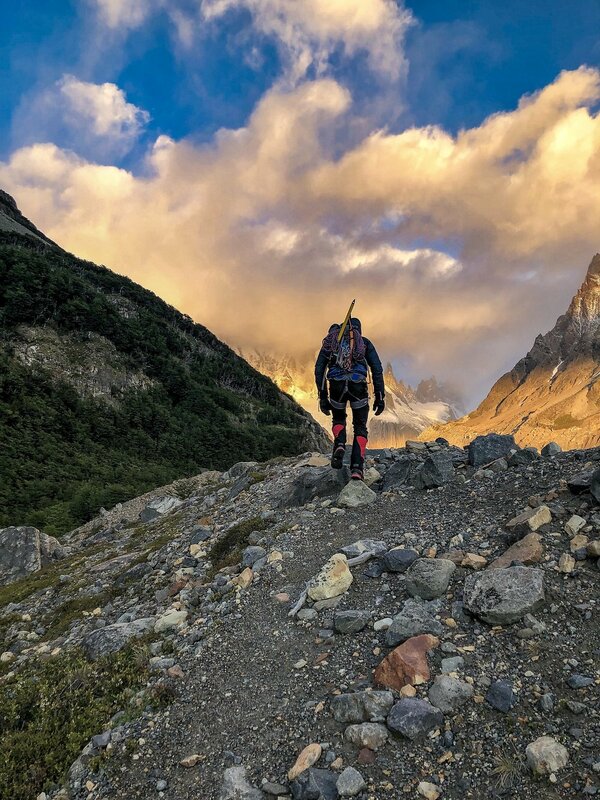 The trail begins 17 km from El Chaltén on the Provincial Route 41 at the Eléctrico river bridge, with a little footpath down a rocky path marked with yellow blazes. The trail is flat and comfortable for about an hour and a half, leading to Piedra del Fraile, one of the coziest mountain huts around. Named after an Italian missionary who took refuge here as protection from the strong winds coming across the Continental Ice Field, you can stay here, have a hot meal, cup of coffee, and soak in a kind of hospitality that warms your soul. That night we had a quick dinner at camp, the winds still howling, the rain coming down softly, and tucked away in the Lenga trees for a few hours of sleep. When the alarm went off buzzing next to us this time, there was not quite as much excitement in the air. The days before still lingered, and the thought of a 3-4 hour approach in the dark, over scree was less than thrilling. We settled into a comfortable pace quickly though, headlamps bobbing methodically in front of us, and even found easy conversation in those early morning with our little trio. And predictably, as it does every time, when those first rays of sun began to fill the peaks and valleys with new light, we found ourselves at the saddle, ready to approach the Amy-Vidailhet route (named for first ascenders Bernard Amy and Pierre Vidailhet (France)) and stoke levels turned all the way up as we could see our objective all dressed up in her best alpenglow. After running around snapping a few hurried photos of the sunrise, taking bites of cookies in between strapping on our crampons and roping up, we started off for 4 pitches of snow/ice climbing to the saddle where we could see if the summit was an option with the weather. 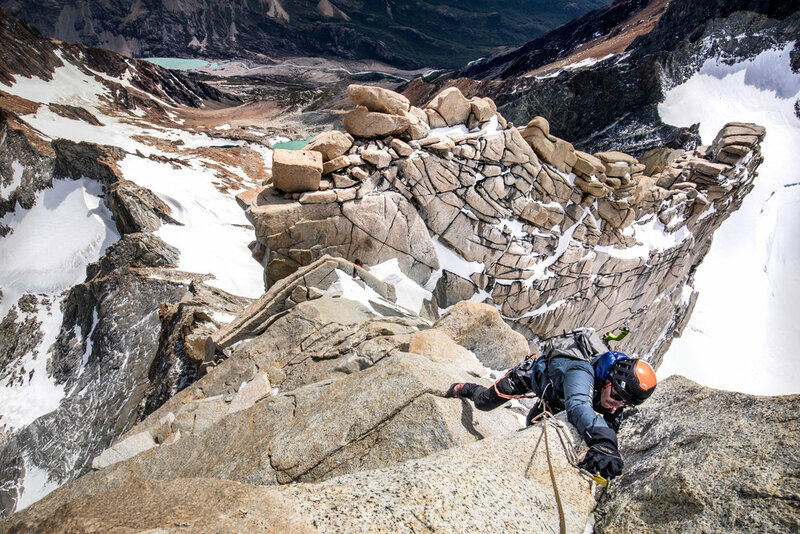 Settling into a groove of swinging ice tools, setting belays, and watching the clouds move quickly in and across the valley, we found ourselves at the next saddle where snow meets rock, and our next decision awaited. The winds were howling for sure, but it was early still, we were the only ones on the route so far, and our group decided it was plenty good to go for the summit. Starting to climb the rock pitches to the top of Guillaumet was one of those moments that doesn’t quite feel real. Looking down and seeing the landscape of Patagonia, with jagged peaks, the glacial lagunas so small and scattered, and the tops of the glaciers jutting out like jagged teeth will stay with me forever. One lost glove, 6 frozen toes and hands, and 4 pitches of gorgeous climbing later, we found ourselves with only the snow ramp left to gain the summit. As we crested the last ridgeline, the north face of Fitz was smoking in the clouds, and the cover lifted like a dramatic veil, uncovering perfect snow-dusted granite that loomed so closely above us. The wind died down, the sun was out, and as Pipa commented, it was truly a gift to stand on that summit in such perfect conditions, for those glorious minutes. 5,456 puffies worn on this day. Megawatt smiles. 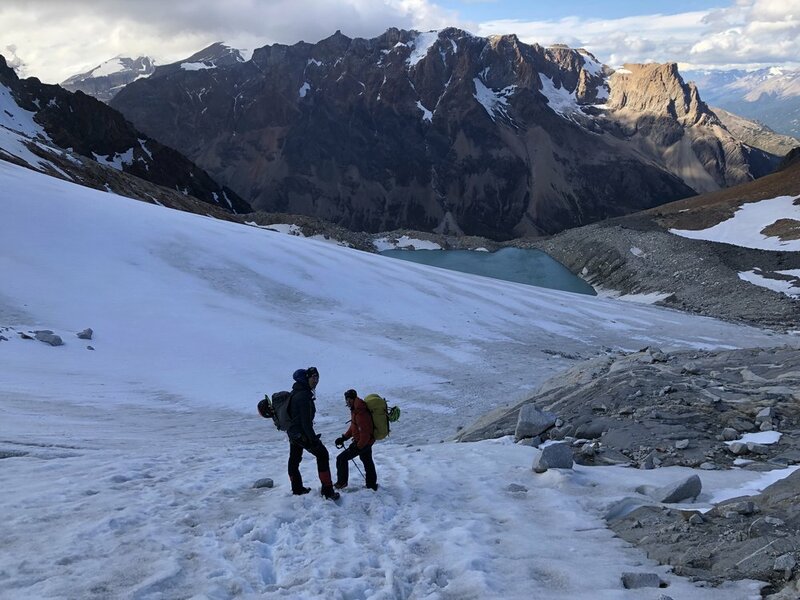 The descent was long and cold, punctuated only by the winds which seemed to kick up to remind us of our place and, of our good fortune to be able to roam in the mountains. The day at this point was approaching 16 hours, and the gusts blew us down to the ground, chipping quickly away at our remaining physical and mental reserves. Back at camp, we broke down as quickly as possible, and one foot in front of the other, made our way back down to the spot that would bring us to the meeting place. Arriving at the bright red bridge, where Pipa’s wife would pick us up in her car, we fell into an exhausted, every-single-thing-hurts, heap. Huddled together for emotional support, just as much to block the winds that were still howling through the valley. The light gave way to a soft dusk yet again as we waited, and the sense of accomplishment and happiness from what we had just done had yet to sink in. Descent, before the wind came in hard…. The little Volkswagen came barreling down the dirt road, and whisked us into its warmth, along with kisses from friends and strangers alike, congratulations, Tupperware of bread, cheese, heaping piles of Argentinian meats, and a bottle of the ever- present Malbec, cork popping off joyfully, and passed around to the flurry of excitement in the car. The hot shower that night warmed our bodies back to normal, rinsing off the dust and dried scrapes from the previous days, warm water running over bruises, tired bones, and bodies capable of so much. Crawling into a real bed that night, under warm sheets with a partner who has now seen me literally rolling in the dirt with exhaustion, supported me through big days filled with weights of decisions and consequences, and still took so much joy and pride from it all, it made every step worth it. The following days brought nothing but rest, lots of travel, trays of warm pastries and even more morning coffee that spilled late into the afternoon. 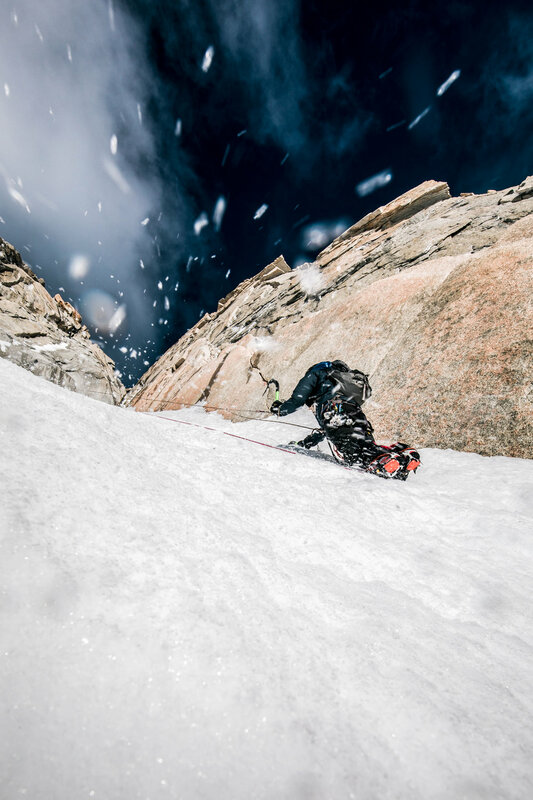 Even back home, we are both still reeling from it all, visions of alpine rock dancing around, slow, secret smiles when looking back over images. It was hands down one of the best trips I’ve ever done, and somehow, that place that occupies all that space at the ends of the earth - that somehow holds more mystery with every return - has etched an even deeper spot into my heart. It's prime time to set up camp across the country, and the lovely state of Virginia just happens to be one of the best spots around to wander into the woods and get cozy under the stars for a night or two. 1) Lots of options, not planning! As opposed to most breathtakingly beautiful locales around the country, you don't need to secure a permit in advance for your backcountry camping trip in Shenandoah and the surrounding areas. Keep in mind that some of the prime spots for car camping do require a reservation in advance, but for a true wilderness experience, head for those rolling mountains! 2) Dog friendly! Again, almost every National park in the country has very strict regulations as far as your four-legged friends go. Shenandoah National Park only has a few trails that the pups are not allowed on, and that is purely for their own safety. So grab that leash, your best friend, and don't forget the t-r-e-a-t-s ! 3) Seclusion meets world class hikes! Virginia is home to some of the most amazing hikes around, with views that stretch for miles and miles over valley, farmland, and rolling mountains. You can typically find a spot to pitch your tent and wake up to the most dazzling views of the Blue Ridge you could dream up, not to mention a sky full of stars on a clear night that you just may have all to yourself. So lace up those boots, take a deep breath of that mountain air, and get ready to hit that refresh button. 4) Romantic Getaway! Few things can strengthen a bond like hiking into a spot with all of your things on your back, setting up your little home, cooking up some mountain fare, and watching the sun set below the horizon. Virginia is for lovers after all, and you don't need an expensive getaway to enjoy the best things in life. So round up your favorite person and set out for an epic adventure in the Blue Ridge. 5) Those views! We already touched on this a little bit, but Virginia has views for days. Everything from the drive on the Blue Ridge Parkway or Skyline Drive is pure heaven on earth, and as you peer out of your tent into those wide open spaces, it only gets better. You can camp near waterfalls, secluded forests, open meadows, or with front and center mountains - it's all right there in front of you. Have fun out there friends, and always remember to LNT to keep VA beautiful. Is there anything better than heading to the water on a hot summer day, especially in the South? The summers in Virginia can be long and hot, but luckily there are plenty of spots to take to the water to cool off, get active, cast that line, or just take in those Blue Ridge views with the sun setting over the water. My favorite way to cool off or just get out on the water in general, is scouting out one of the make lakes in Virginia, grabbing my dogs, and setting up the SUP or kayak. If you want a bit more of a challenge, you can always test out your balance athleticism with a little SUP yoga. It's not for everyone, but it will get you in the mindset to relax and embrace the true spirit of the South in no time at all. Regardless of your chosen activity, you can't go wrong spending a day on a calm and quite lake in VA.
Did someone say beach? Along the the plethora of lakes, streams, and rivers, Virginia has lovely beaches that cater to the family that wants to lay out at a posh resort , or the adventurer that wants to camp at a remote beach site miles away from civilization. So while your first thought when visiting Virginia may be history, mountains, and great wine, don't forget that swimsuit and sunscreen to take in every last moment of summer. Have fun out there everyone! Let's be honest, McAfee Knob off the AT near Roanoke, VA, is not a secret. If you find yourself at the summit, especially in the summer months, you won't be alone. Typically I like a lot of solitude to go with my hikes around Virginia, but this incredible spot may be the one exception. Because this iconic spot is right off the AT, there are always lots of thru-hikers along side the days hikers. The last time I was there, I met hikers from France, Austria, Germany, and Ohio. They were a few months into their south-to-north route, and crawled out of their tents early to make the easy one mile trek to watch the sun rise over the Blue Ridge. And oh, what a site it is! Every time I have seen the sun rise at this magical spot, it has been a different experience as the weather is always changing in the mountains, and with every season comes new scenery to take in. And the truth is, this is just one of those hikes where sharing that moment with new friends makes it so much more enjoyable. Chat with any thru-hiker out there, and each and every one of them will have a story to tell. Want to make a friend for life? Bring a few extra candy bars to give out - trust me on this one. Now let's get to this gorgeous hike itself. If you are aiming to see the sunrise here (which I highly recommend!) plan on leaving the parking lot about two hours before sunrise to make it up. Always bring a head lamp and hiking poles if you are attempting to start this one in the dark, and bring a few extra layers for the sometimes breezy summit. You can also break it up and set up camp at the shelter or the campsite, just be aware this area can get crowded so arrive early. Dogs are also allowed as long as they are on a leash, and be sure to bring some snacks and extra water for them as well. So, whether you are visiting Virginia, or are a long-time resident, be sure to add this one to your list! The combination of mountain views, peaceful hike, and melting pot of people in this sleepy southern town is the perfect combination for lasting memories and a great way to experience the best of the A.T. Happy trails! Adventure dogs and exploring just go together, and there is no place like Virginia for hitting the trail with your furry friends. With the exception of a few trails with tricky rock scrambles, Shenandoah is about as dog friendly as it gets, and there are parks galore with refreshing streams and lakes for your pup to frolic in. Below are some of my doggies favorite spots to get out and play, and why they deserve to come along. Three Ridges Wilderness is one of my favorite spots to bring the pups along. It's a challenging hike, with rewarding views, and a camping spot with a perfect little stream running by to rehydrate after a long day on the trail. Remember that your pups are usually doing twice the mileage you are with all that running around, so be sure to either carry in enough water or camp somewhere (preferred) that provides plenty for them to recover from the adventure. The same goes for food: when doing big mileage, be sure that you pack in more calories than normal to keep them going strong. So you want a little down time after all that backpacking? You're not the only one who loves great views of the Blue Ridge! This scenic drive stretches 105 miles through the Blue Ridge Mountains and Shenandoah National Park, allowing for more than enough chances to hang your head out of the window, take in a sunrise, sunset, or anything in between. Make it a multi-day event by either booking a campsite, or checking out some of the dog-friendly lodging that dots the road. Catch a sunrise! Friends don't want to rally to catch the first rays of light? Luckily your pooch is almost always up for an adventure and will great the day with the same enthusiasm as when you have been away for an entire 5 minutes. In Virginia, there are few places that are more iconic than McAfee Knob, with its rocky outcrop and views for miles of the Catawba Valley and Tinker Cliffs in the distance, it's the perfect spot to spend a morning with your furriest pals. Take to the water! Especially in the dog days of summer (sorry, just couldn't help it! ), there really is no better way to cool off than taking a dip, and Virginia is a prime spot for finding the perfect swimmin' hole. Beaver Creek is perfect for any kind of paddling, and you can't beat Walnut Creek for jumping in for a few laps. No matter where the destination, a day on the water is a day well spent. Get out and play! 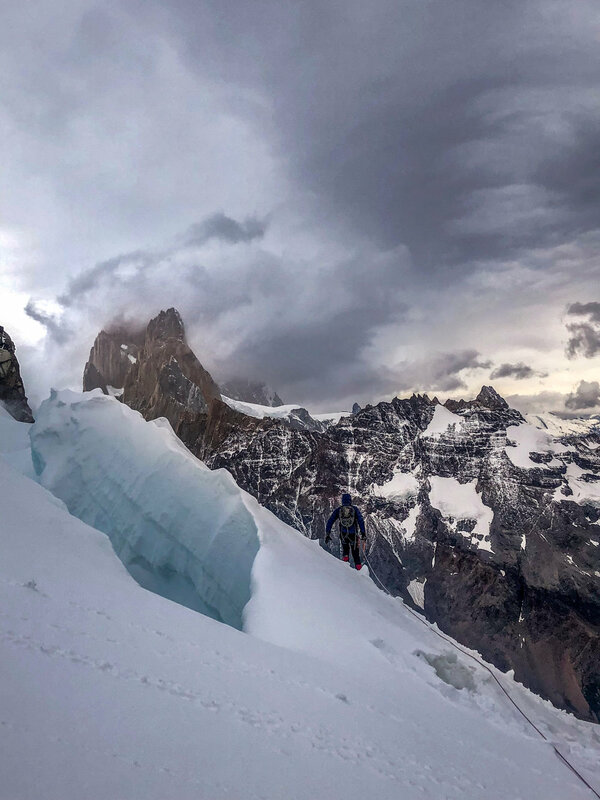 No matter what the elements throw at you, it's important to get out there and take it all in. Virginia has endless opportunities for humans and canines alike, so here's to many adventures with your best friend.